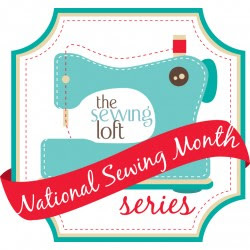 September is National Sewing Month and Heather from The Sewing Loft will feature guests that will share their favorite sewing tools. Each guest will also share an easy "how to" project using the tool. It is worth checking daily!! On Day 1 there is a post on Quilting Index. An online resource for quilting patterns. You will also find an adorable paper pieced pattern and a very useful tool for paper piecing - the wooden iron - on Day 2. On Day 3 you will find a quick and easy tutorial for an eco gift wrap bow! Turn an old t-shirt into something really cool. Day 4 features a fun applique project featuring a tool I will be getting for sure! I'll see you with my favorite tool on the 25th!!! Wow, Thank you so much for sharing! I hope you are enjoying the series. What I'm Working On and A New Sponsor!